With just about a month away from the holidays, this is a great time for getting your holiday gift lists together. Whether you have a whole house of elves to buy for or if you’re just making a few purchases, the LifeTopix app can help you get it all organized. The end result? A magical holiday that won’t leave you feeling overwhelmed. And if you’re braving the Black Friday crowds, no time is better than today to pick up the LifeTopix personal organization app at the App Store, while it’s promotionally priced at 99 cents. This post was created using the next update of LifeTopix that will be available within the next few weeks. It gives you a sneak peek into our enhanced shopping features; however, the LifeTopix Shopping topic provides great value today for creating shopping lists, creating gift lists, and tracking received gifts — all in context with everything else you do in your life. 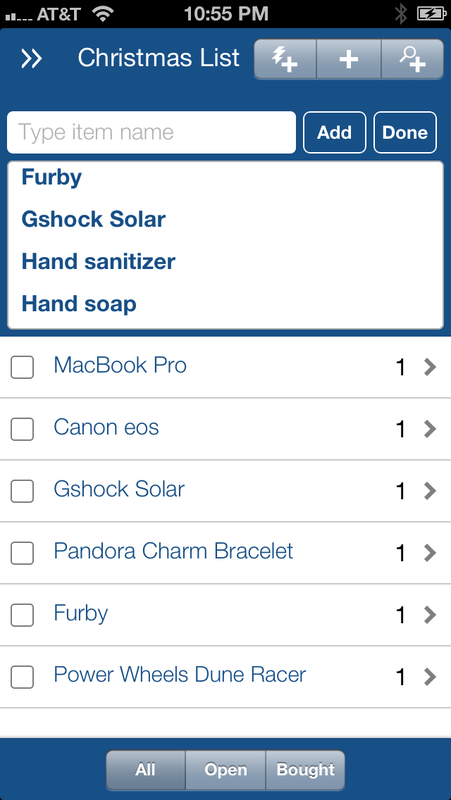 Before you get started creating your holiday shopping lists, you should configure a few sellers in LifeTopix from where you frequently purchase items. LifeTopix works with your iOS Contacts so I recommend starting there. 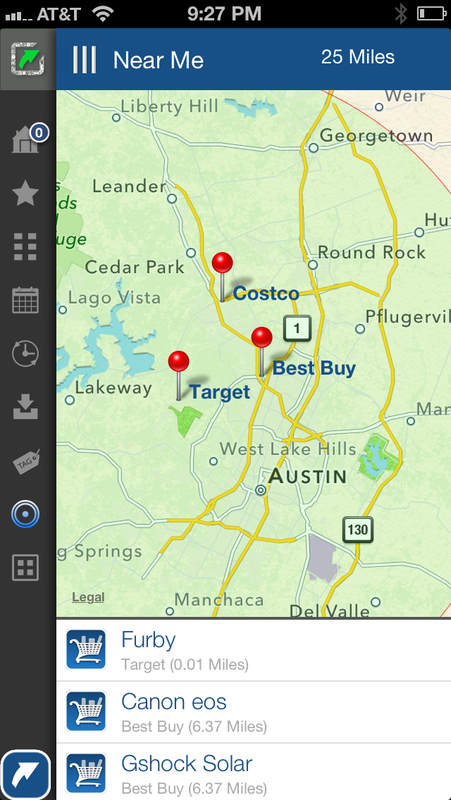 If you’re using iOS 6, a quick way to add your favorite stores is to go to your iOS Maps app, and then enter the name of the store in the search field. When the store is found and displayed, tap it. 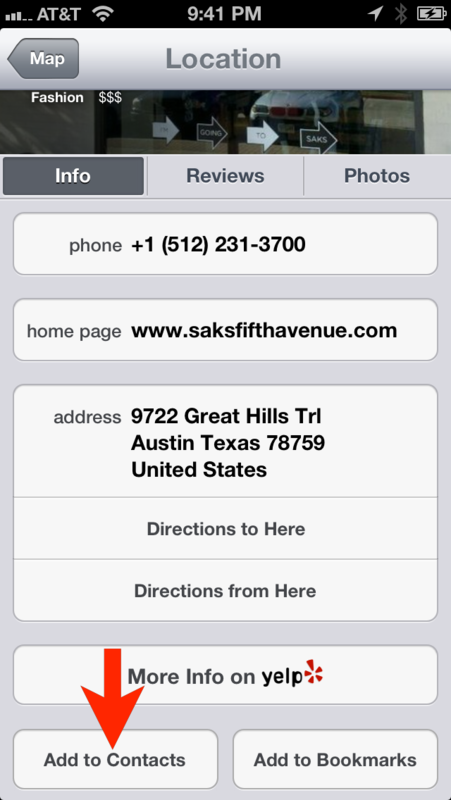 And after the store’s page displays, tap Add to Contacts as shown in the following illustration. 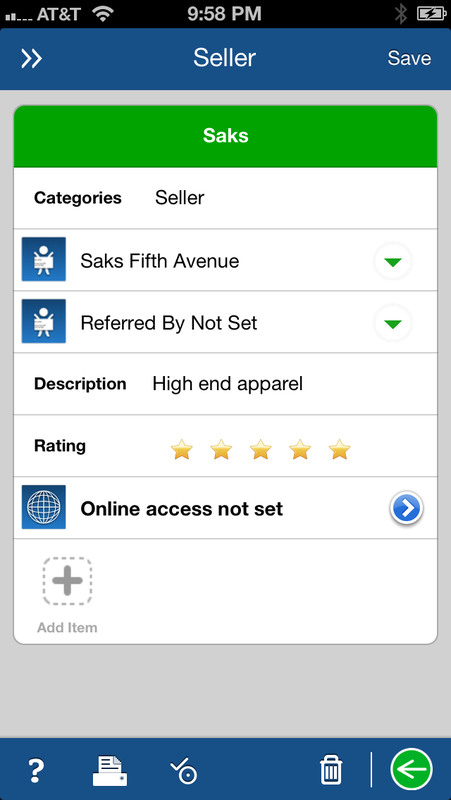 This way, all the location information is saved, and LifeTopix can leverage it for shopping when you add a seller via Shopping -> Configure Sellers in LifeTopix. 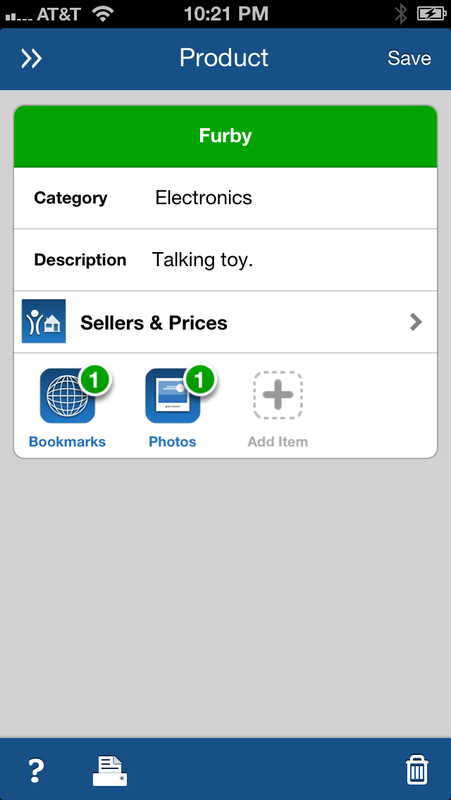 You can see the information for sellers in LifeTopix by viewing the illustration below. 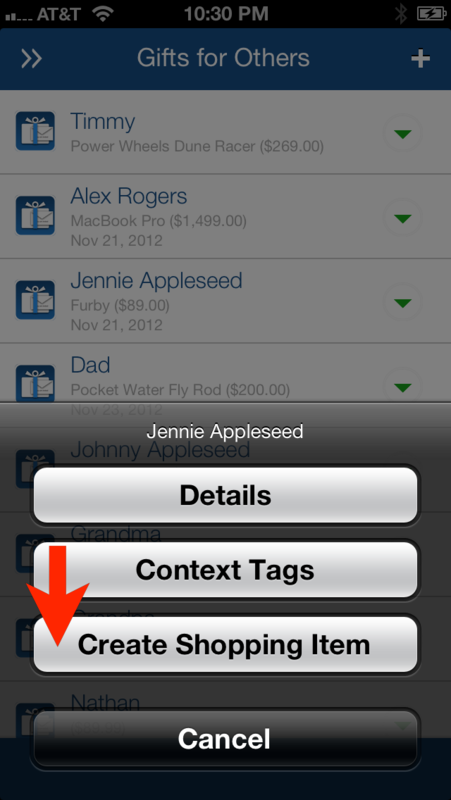 Once your sellers are configured, you’ll be able to associate them to shopping items in LifeTopix. This will be convenient when you’re planning your shopping trips. One you’ve configured your sellers, you can start adding the products that you frequently buy or that you’ll be planning to buy during the holiday season. Take note — you can select multiple sellers for a product, allowing you to choose the best seller depending on location or other factors. To configure products, go to Shopping -> Configure Products, and then click the Plus Sign. An example of a product is shown in the following illustration. Associating bookmarks and photos is especially helpful for products. 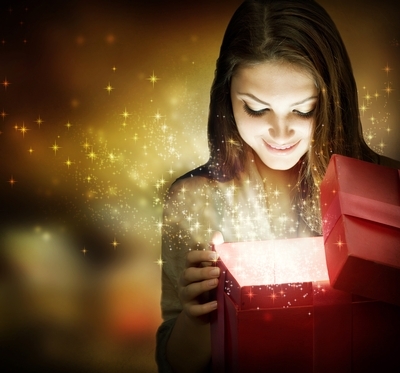 You can link websites with product information or photos of the gifts you wish to purchase. A master gift list with the gift recipients; the products you want to buy; the prices for each gift; and also any tasks, checklists, appointments, reminders, bookmarks, and files (such as photos) is essential for the organized gift giver. LifeTopix makes creating these master lists simple. To get started, go to Shopping -> Gifts for Others, and then click the Plus Sign. From there, you can set this information as shown in the following illustrations. Once you’ve set this information, it’s added to your master gift list and each of these items can be automatically added as shopping items by using the green down arrow and tapping Create Shopping Item as shown in the following illustration. After you’ve finished your master list, and you’re ready to start shopping, you might wish to create a shopping list because it will provide a total cost and also show you the stores in a map view, which will help you plan your shopping trips. Moreover, you can collaborate on these shopping lists with your friends or family via email or social meda. Shopping lists have always been a key component of LifeTopix. They help you keep track of the things that you buy at the supermarket, hardware store, or any other retail establishment. When the holiday season arrives, shopping lists are even more important to keep you organized and sane. In the following example, I’ve created two shopping lists. The first one is my “Christmas List,” which includes the gifts I’m planning to purchase for others. 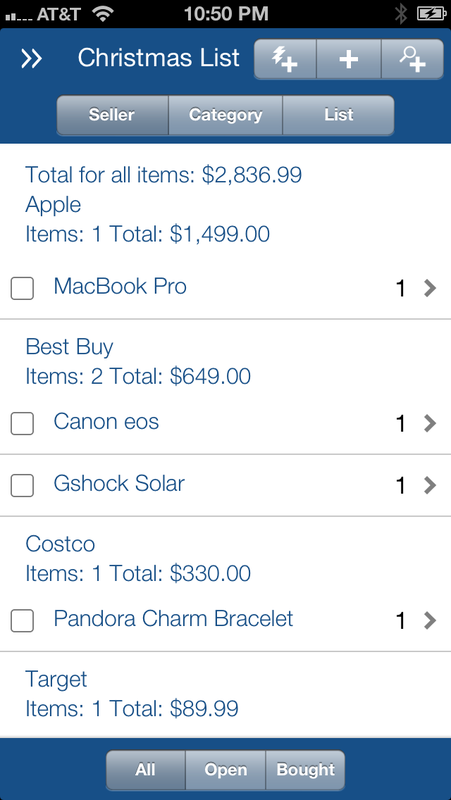 The second list is my “My Christmas Wish List,” which includes the items that I would like purchased for me. Creating shopping lists and wish lists is a great way to ensure all your family members and friends get what they really want. And collaborating with others ensures you don’t buy the same gift for Sally or Uncle Joe. In the upcoming update, we’ve introduced a split screen for adding your shopping items to your lists, as shown in the following illustration. This makes adding items even easier than before. Also take note that you can view the total cost of all your items if you configure the cost for your shopping list items, as shown in the following illustration. Keep in mind, in LifeTopix these lists can be shared via email and then opened on the recipients’ iOS devices and used within LifeTopix. Encourage your family members to use the sharing capabilities shown in the following illustration to share their wish lists with you. You can open the lists directly from your email in LifeTopix by tapping and holding the attachment in the email message, and then tapping Open in LifeTopix. Because LifeTopix Shopping is one of 12 connected life topics, you can see your shopping trips on your master calendar if you’ve set a due date. This will help you plan accordingly, depending on the other commitments that you might have. After you’ve created your shopping lists, and you’re ready to start shopping, location services can help you maximize the time that you have. If you’ve set an address for your sellers as described above, you’ll see the sellers on your map and the products shown in a list below the map. This will help you plan the most efficient route for your holiday shopping trip. We hope this helps you get started with the shopping season. Good luck and happy holidays! Hello! I live in Norway, and have for several years been looking for an app that fits my needs regarding gifting, but I still have not found it. 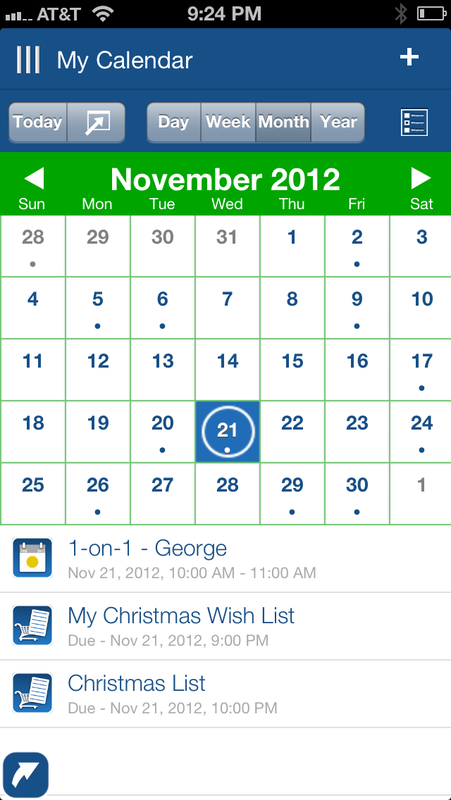 What I am looking for is an app that helps me organize gifting for the whole family. I, as a mother of 3, needs to get an overlook over all the family’s gifts, as in what each of my children gives to their grandmother, what the dad gives to his children, what I give to all of them and so on. I need the app to have several givers and several recipients. For example: Daughter: to brother, sister, grandma, dad, friends. Grandpa: to granddaughter1, granddaughter 2, grandson, daughter. Son: to dad, grandmother, sister 1, sister 2. Mom: to grandma, grandpa, daughter 1, daughter 2, son, friends. Does this app do that? Or can you make it? Btw: This app is so expensive I can not just buy it to find out it is not what I seek, therefore this question here. 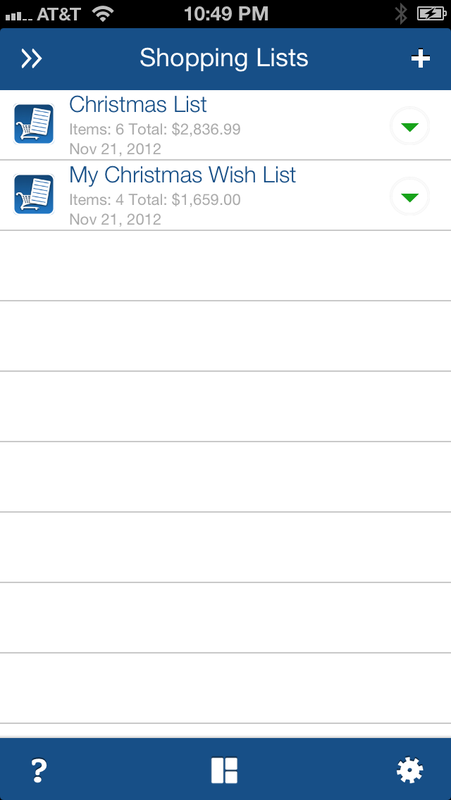 Our apps (under “Shopping + Gifts” topic) allow you to track gifts given and received. You can also use Context Tags for each of these gifts. Gifts can also have the following associations: Shopping Items, Tasks, Appointments, Reminders, Checklists, Files and Bookmarks. If you only care about the gifting topic, then our My.Shopping App might be a good choice. LifeTopix App does a lot more and is our most popular app. Also, if you’d like a phone call, just email us (support [at] lightarrow.com) your phone number and a convenient time. We’re available Mon-Thu 10 AM to 5 PM Central US Time. Fabulous! I am so impressed with your responsiveness, but even more so with the interaction. It is really cool to be able to influence the product. The more I use your app on my iPad, the more I find it to be EXACTLY what I’ve been looking for! After just a few days I feel so much more in control of all that I am responsible for as a working mom……. This weekend I have started to see the benefits of the Shopping touch point, especially the gifts for others. Two things I wish for in a future update are the ability to see the description of the gift I need (eg Birthday Gift or Mother’s Day gift) along with the dollar amount and due date. 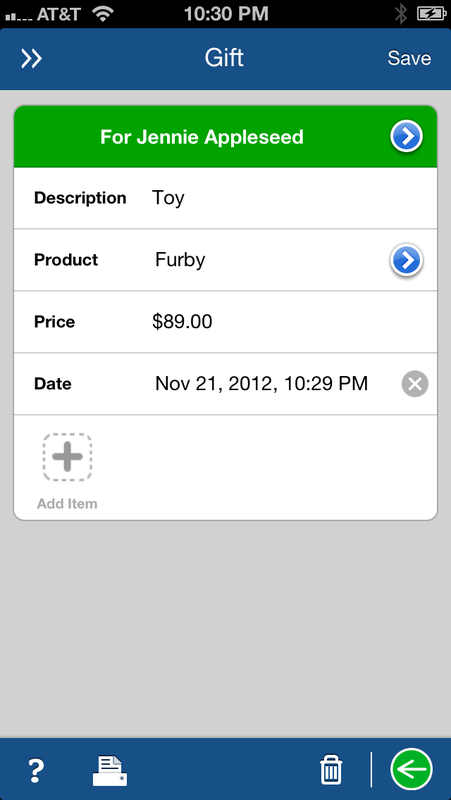 Likewise, I wish for the ability to include a text note field with shopping items. For example, I need to purchase new sheers for my bedroom windows. In addition to the quantity, I want to indicate the size/measurements. Please let me know if there is already a way to accomplish both of these. I saw in another post that you are working in assigning dates/schedules to Checklists. I am looking forward to this functionality as well. Thank you so much! You rock. We are fortunate to have savvy users like you who truly appreciate what we’ve done, and also drive and inspire us to improve the app. 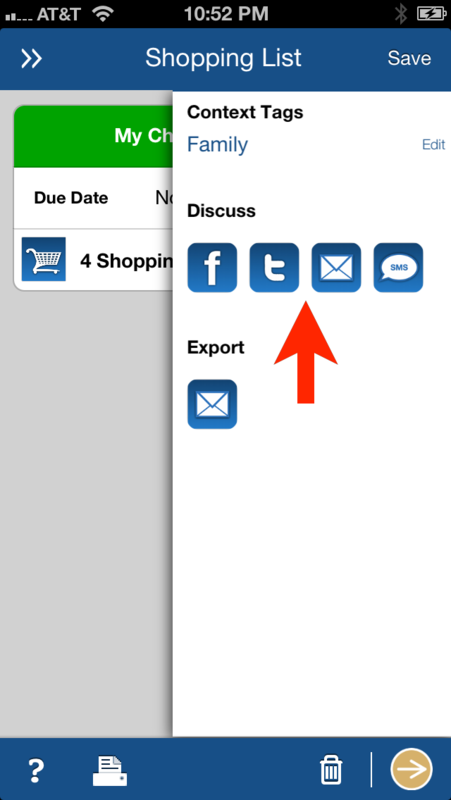 We are actually improving the shopping, notes and people topics in the next feature update targeted for early May. The shopping suggestions you have made are very much in line with what we are working on, and we’ll make sure the developers get your specific requests and do them justice!